The University’s 2018 European Summer Schools, at its postgraduate centres in Paris and Brussels, have reported another successful year. Launched in 2013, the two-week summer school programme is built on Kent’s specialist knowledge and international reputation as the UK’s European university by offering a number of undergraduate students and external applicants the opportunity to participate in academic sessions and cultural activities in these two world-renowned European capitals. 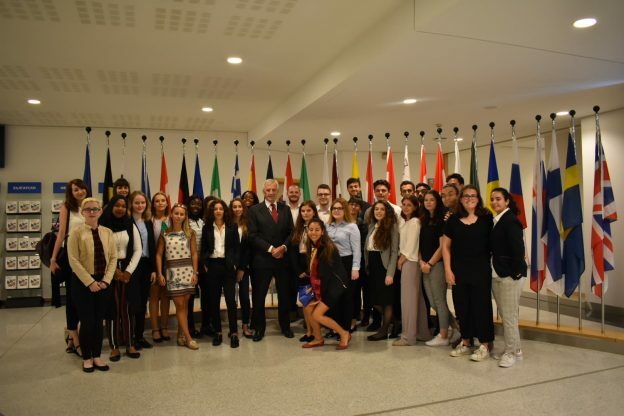 This year, students at the University’s Brussels School of International Studies (BSIS) explored the theme of ‘Europe and the World’, which drew upon the academic strengths of the school. Within this context, various sub-themes were also covered; these included migration and the refugee response, the European Union’s (EU) relationship with emerging powers, and its response to the global economic crisis. Students participated in a series of guest lectures, seminars and debates delivered by academics, policy-makers, diplomats and European civil servants. Students spent two weeks in Paris in an interdisciplinary environment, attending seminars given by expert academics from Kent and visiting important sites and museums related to the programme. These included the Pompidou Centre, the Picasso Museum and the Jardin des Plantes. Sophie Punt, Summer School Co-ordinator at the University, described this year as ‘one of the best to date with more students than ever before signing up’. It was successful in many respects she said but ‘overall this year’s schools have provided students with not only enhanced intercultural and analytical skills, but also provided them with an opportunity to see Europe and its role in the world from a range of different perspectives’. Looking ahead we are hoping to run a summer school at our Rome centre for 2019 which will draw on the expertise in Arts and History-based studies in the eternal city. We would like to extend our thanks to the generous supporters of the schools including the Student Projects Fund for their generous contribution towards the scholarships. This entry was posted in Campus online, Medway Student, Student Guide and tagged Campus online, Canterbury, Medway, Student Guide on 26 July 2018 by Sophia Cheraitia.